Written by the leading authority on CompTIA A+ certification and training, this four-color guide will help you become a certified IT professional with proven expertise in hardware and software, and help you pass CompTIA A+ exams 220-901 and 220-902. 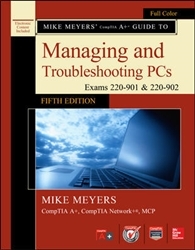 Mike Meyers’ CompTIA A+ Guide to Managing and Troubleshooting PCs Fifth Edition offers complete coverage of the latest exam objectives. You’ll get on-the-job tips, end-of-chapter review questions, and hundreds of color photographs and illustrations. The book also includes a coupon for 10% off of the exam fee—a $37 value. Answers to the end of chapter sections are not included in the book and are only available to adopting instructors. Mike Meyers CompTIA A+, CompTIA Network+®, CompTIA Security+™, MCP is the industry's leading authority on CompTIA certification and the bestselling author of eight editions of CompTIA A+ Certification All-in-One Exam Guide. He is the president and founder of Total Seminars LLC.